Zymox Topical Cream and Spray are ideal in wound care as well as other common skin conditions such as allergic skin and hot spots! Pet King Brands was started in 1998 by president and company visionary, Pamela Bosco and includes several products for pet dermatology and oral care. All of the products share a patented formulation of antimicrobial enzymes developed by Bosco's talented bioscientist brother, Michael Pellico. The LP3 Enzyme System is a combination of naturally occuring enzymes which work synergistically to form their antibacterial and antifungal properties and aid in the health of a pet’s ears, skin and mouth. The reigning flagship products continues to be the ZYMOX Ear products. Over the years, additional products have been introduced to meet the needs of pet owners seeking products without harsh chemicals or antibiotics and their availablity has been expanded to now include select pet retailers. Relief Has Arrived— For Owners as Well as Dogs! ZYMOX® not only brings relief to pets but to their owners as well. Nothing hurts a dog owner more than seeing their beloved dog suffer. Over time, chronic infections can be time-consuming, frustrating and extremely costly to a pet owner. 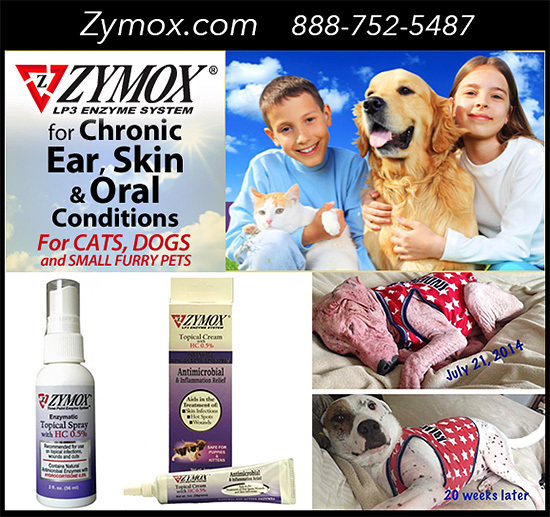 ZYMOX®'s proven product line utilizes the LP3 Enzyme System for long-term maintenance and prevention of chronic ear and skin infections. These easy to use topical dermatology products are convenient, safe and effective. Enzymes are naturally occurring substances which act as catalysts to bring about a biochemical change. Enzymes won’t irritate a pet’s sensitive or raw skin; are very safe, non toxic for pets, people and the environment and most importantly, bacteria won’t develop resistance against enzymes. The patented LP3 Enzyme System in ZYMOX is a combination of enzymes which work synergistically to inhibit, split and destroy the offending bacteria, fungi and even some viruses making the combination antibacterial as well as antifungal. The enzymes only target the invading single-celled organisms, healthy cells are unaffected. ZYMOX® Topical Spray or Cream for Hot Spots & Skin Infections! The most common skin condition both dogs and cats can be afflicted with are hot spots. They are characterized by itchy, raw, sometimes bloody patches of skin. In addition to managing hot spots, the Zymox Topical Cream and Spray are ideal in wound care as well as other common skin conditions such as allergic skin.. Does It Matter What Kind Of Skin Infection or Hot Spots My Dog Has? Regardless if bacterial, fungal or yeast, ZYMOX can be applied 1x/day as needed with no pre-cleaning or scrubbing of the skin because the LP3 Enzyme System reacts with the infectious pus and debris to form its antimicrobial properties and will naturally clean and disinfect the affected skin. ZYMOX is safe, gentle and non-toxic and worry-free if a pet licks application site. Both contain hydrocortisone for additional inflammation relief. What About Hard To Reach Places on My Dog? The TopicalCream features a catheter tip which is ideal for hard to reach applications such as skin folds and helps you target the application to whatever area your dog may be in need of receiving the soothing benefits of Zymox! My Dog Has Ringworm— Can Zymox Help? Yes, Zymox can help your dog overcome Ringworm, Impentigo, and yeast infections! What About A Bathing Product To Help My Dog With Hot Spots and Skin Infections! You will be glad to know that Zymox’s Shampoo and Conditioning Rinse is made specifically to sooth hot, itchy, miserable skin! We know that itchy skin is a serious discomfort and concern for your dog. He or she needs help NOW. You’ll love the way our Shampoo and Rinse leave your dog feeling both relieved, refreshed and smelling wonderful. Zymox® Shampoo for Itchy Inflamed Skin is the first line of defense against infectious microbes is the skin. ZYMOX® Shampoo provides an effective way to protect this natural barrier without being irritating or drying. Only the mildest plant surfactants are used and the enzymes have anti inflammatory properties to calm the skin. The LP3 Enzyme System with the addition of Vitamin D3 helps relieve surface irritations and hydrate the skin. The shampoo contains no harsh detergents, chemicals or petroleum bi-products and features a pleasant, mild fragrance. Zymox® Conditioning Rinse for Itchy Inflamed Skin produces a powerful protective barrier against minor skin inflammations and surface irritations due to bacterial and fungal microbes. The LP3 Enzyme System with Vitamin D3 provides optimal protection for the skin. For best results, wash first with ZYMOX® Shampoo and use as a leave-in rinse for residual effectiveness. Can also be safely applied full strength directly to most problematic areas. Note: Use as a Leave On rinse for between bathing protection & relief. What Do People Say Who Have Used Zymox®? We started our dog on the Zymox® Shampoo and Rinse in July. This treatment made all the difference in the world. I just called order the shampoo and rinse hoping it works on her skin allergies. Once I get those products I feel sure the skin problems will go away. I have so much faith in Zymox® I can't wait to get the products. Don’t Let Your Dog Suffer a Minute Longer! Buy Zymox® Today! Hot Spots, Itchy Skin and Wounds must be dealt with— and Zymox is the product to do it. You’ll love the affordability, the ease of use, but best of all, you’ll love the way it makes your dog feel— and look! Zymox is available at DrsFosterandSmith.com, JeffersPet, HorseHealthUSA, and distributors across the country!